Most NY retirees move down to Florida, bravely running the risk that the extreme humidity will warp their canes/bridge tables/minds. 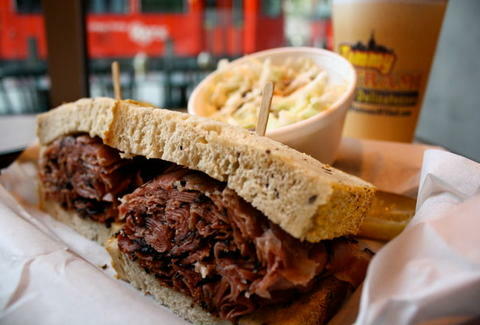 For sandwiches from a New Yorker who retired out West instead, check out Tommy Pastrami. Just opened, Pastrami's run by a longtime NYC deli-worker who retired to the temperate OC before boredom forced him to open his own shop, which now slings City-style grub out of a narrow space with palm-shaded patio seating and a 10' replica of Lady Liberty, meaning she's big enough to shelter you and your huddled...one friend. Early-riser options include locally roasted coffees, build-your-own "4x4" break-wiches (choose egg style/meats/cheeses/bread), breakfast burritos, authentic "Brooklyn NY" knishs, and pastrami or corned beef "New York Hash", not to be confused with Humboldt Hash, though both will dampen your morning productivity. Big Apple lunching comes via "overstuffed" sando's served on house double-baked rye, with eight cold options like Kosher Salami and chopped liver, and hotness like brisket with au jus, BBQ Brisket, pastrami, and corned beef, and a more inventive, coleslaw'd flatbread-wrap stuffed with pastrami or corned beef and dubbed the "Sloppy T", which pities the fool that eats any sloppy boringly named "Joe". They've also got deli meats/cheeses by the pound, and Brooklyn's Dr. Brown's Soda, named for a doc who treated NY's immigrant children in the late 1800's, but stayed away from elderly patients -- those 35 year-old's were crazy.